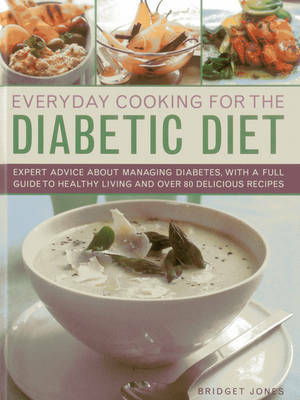 This title features expert advice about managing diabetes, with a full guide to healthy living and over 80 delicious recipes. It is a guide to living with diabetes, with helpful advice on managing the condition, alleviating the symptoms, controlling weight and reducing medication. It includes 80 recipes to inspire the diabetic cook, with tempting meals that can be enjoyed with family and friends, such as Wild Mushroom and Fontina Tarts, Grilled Mackerel with Dahl, and Baked Ricotta Cakes with Red Fruits. It brings together the latest thinking on dietary and lifestyle advice to help explain the condition, provide guidelines on what and when to eat, and how to tailor food intake to individual requirements. It covers full nutritional notes, including glycemic load, are supplied for every recipe, with over 400 photographs, including step-by-step sequences for every dish. This authoritative, practical recipe book begins with a detailed introduction on living with diabetes, the necessity of weight control and the importance of exercise. Carbohydrate counting, fat reduction, cholesterol control and portion management are all covered, as is the complex but vital low-glycaemic index. There is a special section on diabetes in children, as well as advice and support for how to manage the condition in puberty, pregnancy and throughout the aging process. The 80 recipes that follow provide everything that is needed for a varied and enjoyable diet, with recipes that friends and family will enjoy eating. Chapters include healthy and sustaining snacks, as well as breakfasts, main dishes, appetizers and puddings. To prove that diabetes does not mean denial, all these satisfying recipes are packed with taste as well as goodnes,s and are presented with full breakdowns of nutritional values.